may also valet with us at Bricco 241 Hanover st. Incredible food and wonderful ambiance. Highly recommend. Always a great meal and experience!! Aqua Pazza was a real treat! Being vegetarian, I was worried about a seafood-heavy restaurant, but I found several dishes to eat. My friend and I shared the zucchini flowers and eggplant parmigiana as antipasti. Both the zucchini and the eggplant were tender and flavorful. I ate the cacio e pepe for my main meal. The noodles were cooked to perfection and the sauce was super tasty. We enjoyed the unique cocktail offerings. My only complaint is that there was not great variety in the desserts! Loved the open and airy feel of this restaurant. Half of the walls are lined with windows and between that and the white walls, it just makes it seem really bright and clean. I went for the fish but ended up ordering a burger after spying a woman at the bar tearing into one. Good call, because it was just as delicious as it looked on her plate. Overall, portions were very generous. My wife ordered the arugula salad and it was enormous. Luckily, our waiter had warned us about it so we didn't order 2 separate salads, and just split hers. Her pasta pomodoro was also big, but she cleaned her plate. Staff were all very pleasant and attentive, but our waiter totally forgot my second drink order. Seemed like a cozy neighborhood place, nice mix of people young and old. I would go back for more. Wonderful place. Service was excellent and the food incredible. We made reservations at 9 pm on a Saturday. We were not seated until 9:25 pm. The table next to us was seated at the same time. We did not receive water until 9:50 and bread until 10:15 pm. Once the restaurant was nearly cleared out our service did get much faster. There was a minimal apology for the extremely delayed service. The food is excellent though. I went the previous week at 7:30 on a Friday and had a much more enjoyable experience. I think the seating since it is minimal, is better for an earlier dinner. I would recommend only getting a 7:30 or earlier reservation. Very good food, only downside is the size (one primo is not enough). But very good service and atmosphere. Everything about this restaurant exceeded our expectations. It is pricey but we knew it going in as we had reviewed the menu online. Delicious food. Great space. Super friendly staff. Definitely not a tourist trap! Can’t wait to go back. Our party of 4 arrived for a 7:15 Saturday evening reservation and got seated pretty quickly. It took 15 minutes for the waiter to come over for our drink/app order and another 30 minutes until the wine we ordered had arrived. By this time it's after 8pm and we hadn't received our oysters, so we asked (again) for bread, which finally arrived at 8:30 along with our oysters, which we scarfed down pretty quickly. Our dinner didn't arrive until after 9pm, luckily the food was good, but still outrageously late for a 7:15 reservation. What we found most frustrating was that another party of 3 who was seated near us at 7:30 was out the door (drinks+apps+entrees) by 8:50pm... while we were still staring at our empty tray of oysters and trying to milk our wine until making it to entrees. The waiter brought us each a small glass of limoncello with our check as an apology of sorts, but at that point it was too little, too late. We had plans to try and catch a 9pm show, thankfully we hadn't purchased tickets yet b/c we never would have made it. In short, they are clearly understaffed -- but if you have more than 2 hours to kill and a lot of patience, the food was quite good! The oysters weren't anything special and the entree portions weren't huge overall, but the pasta dishes + scallops were delicious. On the heels of Devra First/Globe review, which was mixed/confusing at best, we gave it another shot. The vibe defined a fun/beautiful/energized perfect place on an early spring Sat eve. The fab craft cocktails were being shaken and the bar was in full swing. Altho' we had two more guests than we reserved for, the front-of-the-house was accomodating, warm, and welcoming. The service is absolutely spot-on. Tom Schlesinger-Guidelli clearly has burnished great service in each and every server, leaning over to any guests that might seem to need something. Fantastic. AND, when we asked for a sommelier, Tom, himself came to our table. Bent over backwards to accomodate where we wanted to venture in wine. The ONLY attribute that holds us back from a full 5 stars is the food. Inventive menu, but execution is not up to what we know this could be. Brussels sprouts were a mash of yuck. Grilled chicken was dry . Inconceivable for a restaurant that clearly aims high. Mussells were blah, and the broth was downright disagreeable. Did the chef taste it? HOWEVER, we will return. Hope that they iron out lingering issues and go from good/quirky to great! Outstanding food and service. Have been here several times and it is always top notch. Great menu and great staff. Good luck on the parking. Take a Lyft! A friend and I wanted to try something new in the North End and mix Italian with Seafood. Aqua Pazza fit the bill amazingly well. We had oysters on the half shell to start - they had a great variety. My friend tried the fish and I had the veal - both were extraordinary. We enjoyed the location and the layout - a really great place for excellent Italian seafood! We were seated immediately and our waiter came right away. Menu choices were interesting and varied. 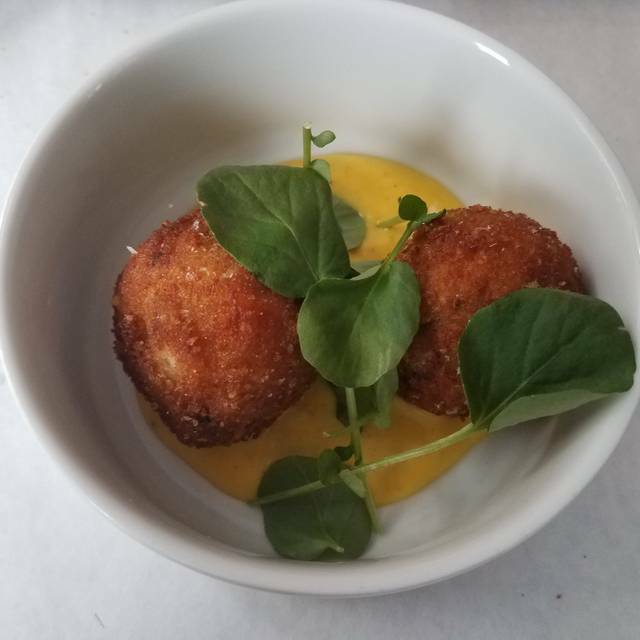 We choose the arancini, perfect size and delicious, and the octopus with fennel and citrus - outstanding. These 2 were enough for 4 people. Two of us split the whole branzino, which was perfectly cooked and more than sufficient. The wine list is small but varied so that we found a lovely pecorino to accompany the fish. We had to pass on desert because we were too full. Our waiter brought complimentary lemoncello after our meal. My only complaint is the excessive noise level. I do not understand why some restaurants - and patrons - find this appealing. At times we could hardly have a conversation. The noise decreased as tables cleared but honestly this level of noise can ruin an otherwise lovely meal. 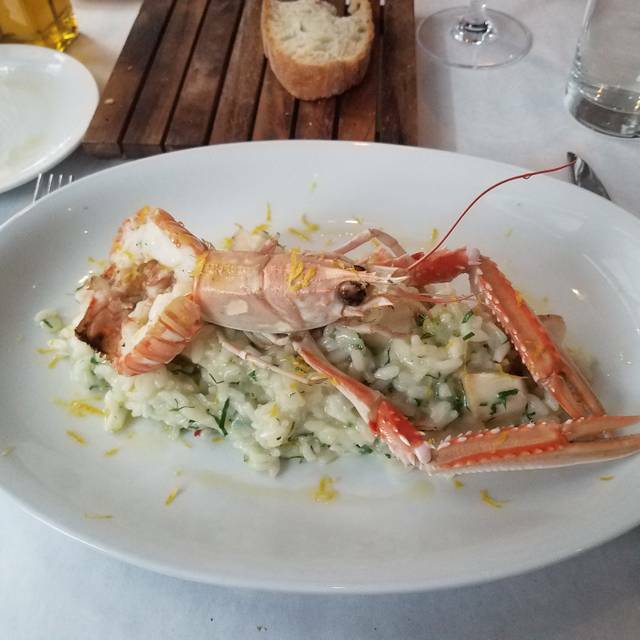 Our meal at Aqua Pazza was so special! We loved the freshness of the seafood and the great service. Definitely recommend! We stopped in for restaurant week. The food was amazing and the service was great, too. They had run out of some of the items, but offered awesome substitutions, and everything tasted very good. Will need to find a reason to stop back in soon. We absolutely love this place the food is so fresh and nicely prepared and they have an excellent set choice of Italian wines. We have been to Aqua Paza several times and just love it, always great. I highly recommend this place. The service was good very friendly but the food was su-par. We ordered the seafood arancini for an appetizer and it was just flavored fried rice balls. We then had the lump crab carbonara which we thought at first the wrong dish because we didn’t see any crab. Looking closer it was minced crab very sparingly throughout and tasted like it was tossed in Lipton chicken soup broth. I ordered the Wagyu beef burger medium and it was served bleeding. Taste was ok. The other entree ordered was the sirloin which was way over seasoned, fatty and grizzly. Pretty much inedible. The best part of the whole meal was their in-house made olive oil and bread. We were excited to try this restaurant because we are big fans of the sister restaurants and were disappointed because this didn’t live up to nor was it close the the quality and experience of the owner’s other restaurants. 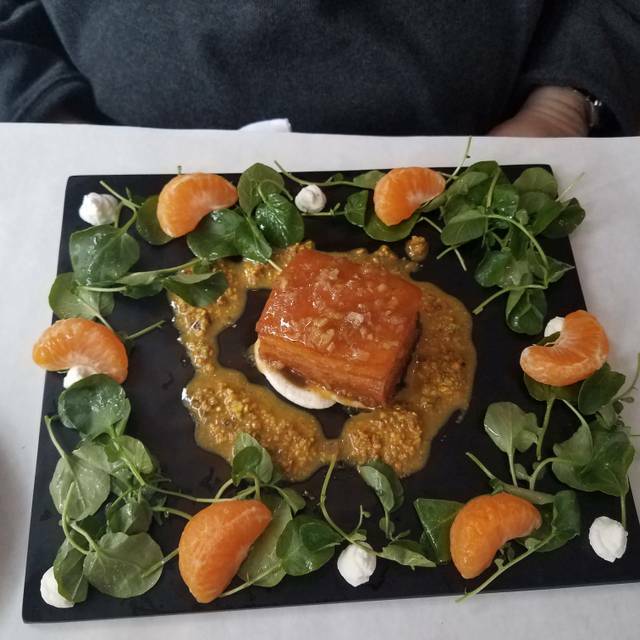 Visited for Dine Out Boston– three course meal was delicious and had excellent presentations, although portions were on the small side. Surprisingly, I would recommend the Kobe burger over a pasta for the third course... it was great! Service was good but a bit slow. The overall ambiance is awesome, great decoration and lighting, I just wish they didn't have a TV playing a food channel!! Why?? Overall, enjoyed the experience but I'm not aching to go back. I like a relaxed feel when I go out for diner - service was definitely above average but could be a little more relaxed for our taste. I tried other places of the same owner and this was like the copy of the original, not bad but not at the same level. The antipasto bruschetta and fried miso were ok, and the Gavi was affordable and easy going, but for some reason the orata was way too dry, and the salmon didn't impress anyone, while the octopus(my favorite dish, I order it most of the time) wasn't what I expected. 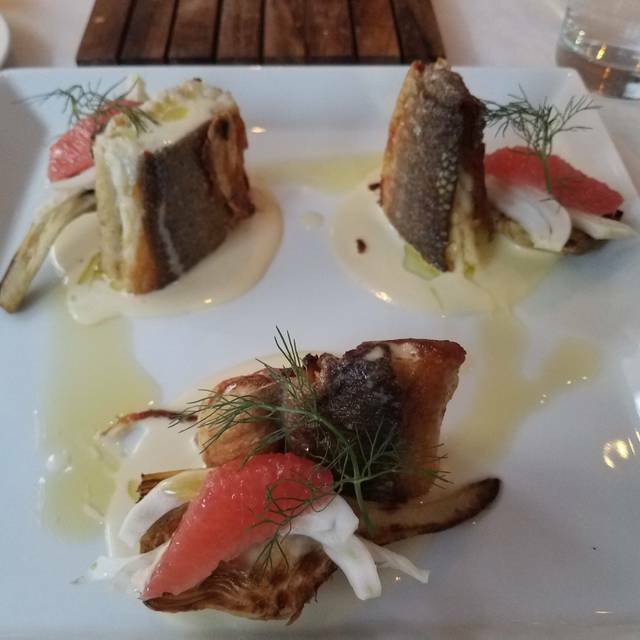 The table was split on the branzino. The dessert was awful, no-one liked it. I give it overall a 4 stars because we had a great time seeing our friends visiting Boston and the place was our choice. Nice waiters, very knowledgeable about everything from the food, to its sources, to the spots in the surrounding area that they recommended. Great good. Lovely service. It was a quiet night, so the chef came over to chat with us on a few occasions. I enjoyed it very much. Best burger I've had in my life. It's not your average cheeseburger, it's one of those artisan creations covered in things that otherwise have no business on a burger, but whoever's in the kitchen back there really knows how to make it work. Absolutely spectacular. The cocktails were excellent as well. Our server was knowledgeable and friendly. Overall a 5-star experience. I'll be back! Excellent food; rude maître d'. What way to make our group feel uncomfortable by asking us to mind the time before even seating us and not offering us dessert. Disappointing for one of my favorite restaurant groups. The food is wonderful and Marina is a great waitress! My experience was an all around amazing time! The staff are very educated and accommodating about the menu. The level of service was excellent! No concerns whatsoever and would highly recommend due to my experience. Quality restaurant. Food is delicious. Good presentation and service. We had a fun evening celebrating our son's birthday with family. The food was special and delicious. The servers were friendly, pleasant and attentive. Delicious food, interesting and unique flavor. Excellent service. Our dinner at Aqua Pazza was such a treat. The food was delicious! The flavors were fresh and balanced. We appreciated food varieties, and the exciting aromas and taste. Our server was excellent - friendly and knowledgeable - and we enjoyed the pretty atmosphere. 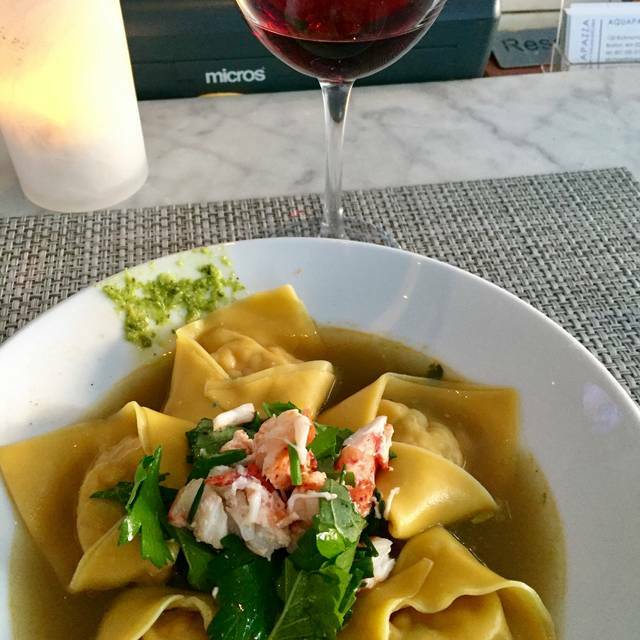 Aqua Pazza is better than any tourist trap you’ll find in the north end. 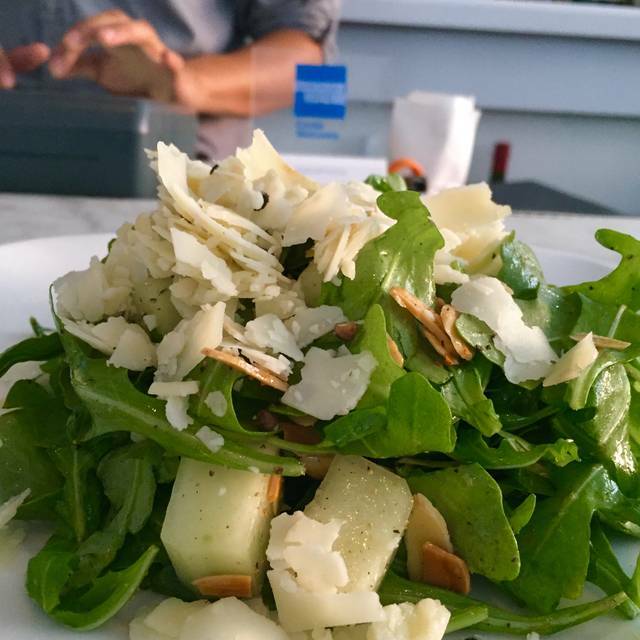 The food is always delicious (particularly the burrata, the smelts, the Tuna Crudo, and any pasta dish!). Everything is so fresh and the portions are perfect. The service is always delightful as well. ALSO, their beer selection is better than anywhere in the north end. They clearly put a lot of thought into everything. Great date spot. Love the branzino aquapazza style. 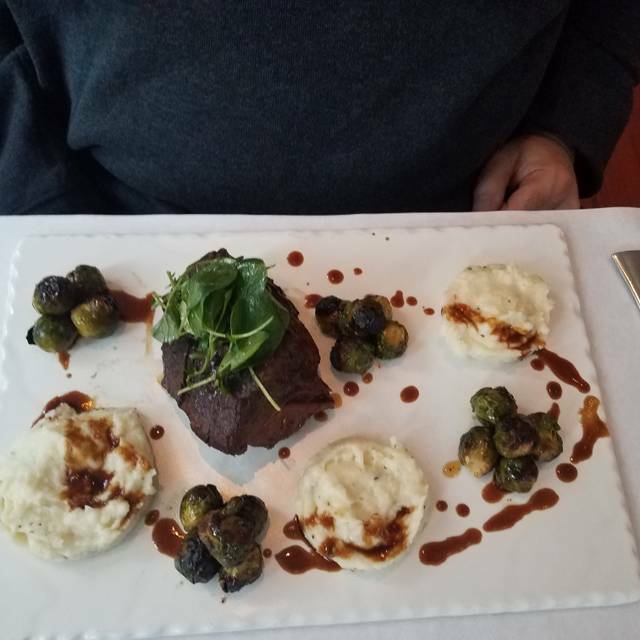 The service was excellent, the waiter fully and expertly describing the menu items, recommending excellent wines and overall helping make the dining experience pleasant. The menu, while small, had very sophisticated items. Their bruschetta, both the smoked salmon and the tomato and cheese was outstanding, as were all of the main dishes the four of us ordered. Good restaurant excellent service served mostly seafood and the food was exceptional. Two words: Crab carbonara... 'nuff said. Very nice dinner, fresh fish, good cocktails and wine list. A little cramped, but overall, we'll be back! Really enjoyed octopus and smelts.